Our team leader had to take a decision; to wait for horses with the entire team or go ahead of our load. If we had the strength to make it straight to Laya then going ahead won’t be a problem because we would get some sort of shelter and food for the night but if we land up somewhere between nowhere we would be in trouble without tents and ration. There was no cellular network in the area. (Of course we were told later that there was a small patch of land close by where the non-smart phone could receive network). There was no guarantee the horses would come, and even if horses did come they weren’t like taxi to make endless trips. Animals would need rest. Five from our team stayed back to wait for the horses and rest of us began our journey. I was separated once more from my two staff. In little more than two rainy hours we reached Koina. This was said to be the place where Zhabdrung took rest during his long flight from Tibet in 1616 and therefore it was named Koina, derived from Ku-nyel-na. The place had a guesthouse for travellers. It was merely a shelter with three empty rooms. Retired army Tenzin and his family who ran the canteen occupied the fourth and fifth rooms. Leki was the logistical official at Koina for this festival period. He welcomed us with tea and backed it up with a much-needed lunch. 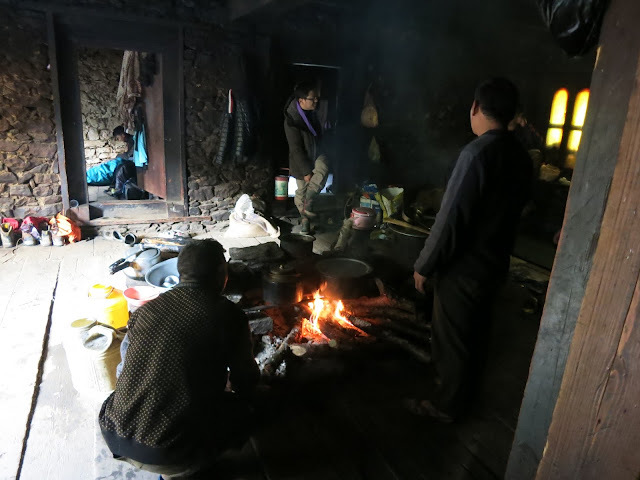 It was still early in the afternoon though the overcast weather made it seem very late and it was still possible to make it to Laya or somewhere closer but without any form of communication with our team in Ponjothang we couldn’t risk leaving the shelter in Koina and Leki’s hospitality. Leki offered us an empty room to crash in for the night in case we had to. We spend the whole afternoon talking about everything like in good old times. We literally relived the legacy of Zhabdrung by taking the longest rest in Koina. People who were there before us left before we finished settling down and others who came after us took brief tea breaks and carried on. We had all the time for ourselves with nothing to distract us from telling stories of our lives that would otherwise never be told in smartphone era. While we were digging out our memories and laughing endlessly our team leader received the message that he dreaded. There won’t be any horses for the day to bring back our load. But before our smiles faded he announced that Chef Jigme and Artist Dorji from our team in Koina had volunteered to go back to Ponjothang and get us our sleeping bags. I was simply awed by the compassionate courage of these two men to walk back the whole stretch and return with our sleeping bags. I couldn’t thank them enough for the giving us the beautiful night in Koina. Among the many who came inside the Koina guesthouse that day after us only Dasho Sangay Khandu decided to stay back with us. His entry was the beginning of the next episode of our night in Koina. Taking advantage of our friendship I complained about the road conditions to his Gasa. He said he could only ask for it like the rest us and that it was Lyonpo Damchoe I should complain to. He however said that the having that mere road in itself was a blessing Gasa could enjoy only recently. Gasa had to endured with minimum development because it had been a Dungkhag under Punakha Dzongkha for a long time. Upon asked how Gasa could even dare to host a festival of this magnitude without having so many basic logistic in place, he said that an able leadership would have the foresight to see order in chaos. While it also seemed like a nice justification to our innate complacency but the words went echoing in my head for a long time. And it made perfect sense to me when I finally saw the magnificence of the festival later in Laya. If it weren’t for that night I wouldn’t know that we still could spend hours at end talking with fellow human beings. If we were dots, our stories were lines connecting them and at the end we were all interconnected. Even our retired solider host wasn’t left out; he confessed he was among the group of soldiers who bashed up Dasho Sangay and Chimi Zom’s mate in Sherbutse. To add special effects to our tales there was continuous supply of beer at much cheaper price than any club in Thimphu. One thing was confirmed, unlike road and mobile network, beer was everywhere. Learn from beer! No experienced traveller would stay up so late and drink like we did ahead of a long journey but I further proved how big an amateur I was by continuing my night with Leki. Two of us became the voice in the silence of the dark night. 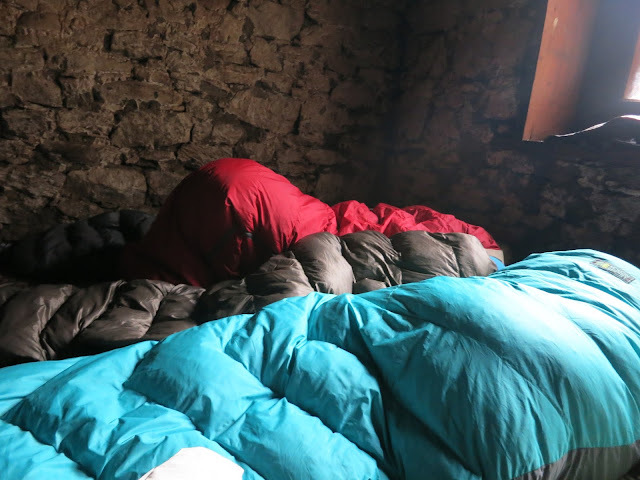 Often we could hear giggles muffled in thick sleeping bags indicating some of our roommates were listening to our conversation while still pretending to sleep.When I finally got into my sleeping bag I felt so lonely. The silence in the room was deafening so I said a few lines of humor to check if they were really asleep only to find that all of them were trying hard to sleep. Except for little Menda the rest jumped back in conversation while I quietly slipped away into my dreams. From deep inside my sleep I could hear them curse me for disturbing them.